Imagine if you can: You’re hurrying through the airport to catch your flight. You are a road warrior, so the airport and work go hand in hand, so you’re on a conference call using your headset as you rush to your gate, bobbing and weaving to avoid the crowds. You’re running late for your flight, and you’re doing everything you can to avoid missing your boarding group…and you don’t want to miss your boarding group because you won’t have a space in the overhead compartment for your bag otherwise. You have your laptop in one hand, pulling a roller bag in the other, ear buds in…and then it happens…blammo…someone jumps in front of you, hits your arm, and your laptop goes flying. You watch in slow motion as it hits the floor…oh, the horror. The screen shatters…people laugh at you and cry with you because they, like you, know there is no way it will power on after that. And the real kicker: You are on your way to NYC for the big presentation—which was only on your laptop—and the presentation is in 4 hours. GAME OVER! Most of this is a true story. It happened to me not more than a month ago. The only difference is that my presentation was being backed up into the Azure Cloud as I was drafting it! The laptop was history, but my presentation, along with all of my other important work-related documents, were sitting comfortably in Office 365 in my OneDrive account. And it gets better: I was able to access my presentation on my phone, using it to project it for my customer! What a fun story to tell them, and a good talking point about the power of Office 365 and the modern workplace. Viva la Business Continuity! Many people often ask me, “Isn’t Office 365 just the newest version of Office?” Yes…and no. It might offer the same productivity applications you have come to know and love, but it comes with many other Cloud services that work together to transform the way you work in your digital office. With products like Skype for Business bundled in Office 365, I never miss a phone call because they ring on my laptop, cell phone, desk phone, tablet, iPhone, etc. (provided I configured the devices properly and my company policies allow it). I have access to company documents on which I’m collaborating with my peers available to me in Teams or SharePoint online. Cortana schedules meetings for me across my and my customers’ calendars by simply including Cortana on the email and asking her to schedule it for us. My documents are always backed up in the Cloud and available across any device. If you see that icon, you can skip to Step 2. 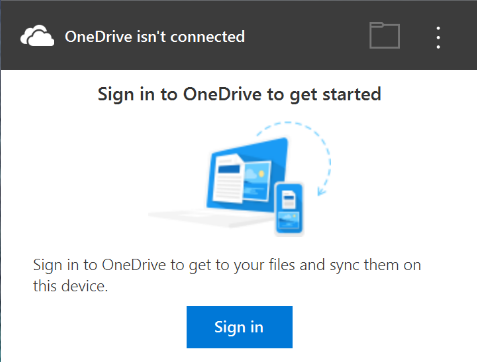 If not, you need to get the OneDrive app running from the Start Menu (it comes with Windows 10 – check your Windows 10 installation if you can’t find it in the Start Menu). 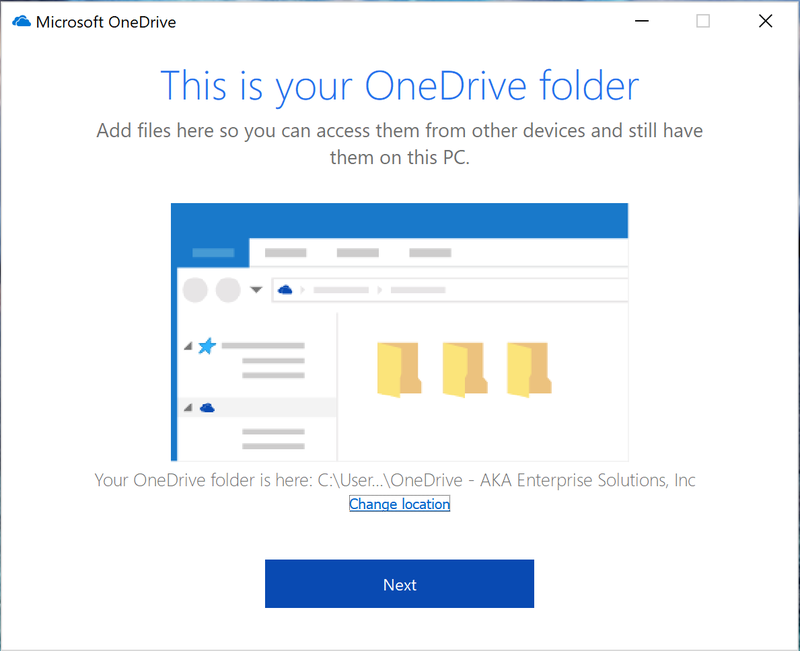 If you are running another version of Windows, don’t worry: There are OneDrive for Business downloads available from Microsoft. This is the step most people forget to do, which is why I do it first. Right-click on that cloud icon from Step 1 and select “Settings” from the context menu that appears. Go to the settings tab and make sure that you have “Start OneDrive automatically when I sign in to Windows” checked. 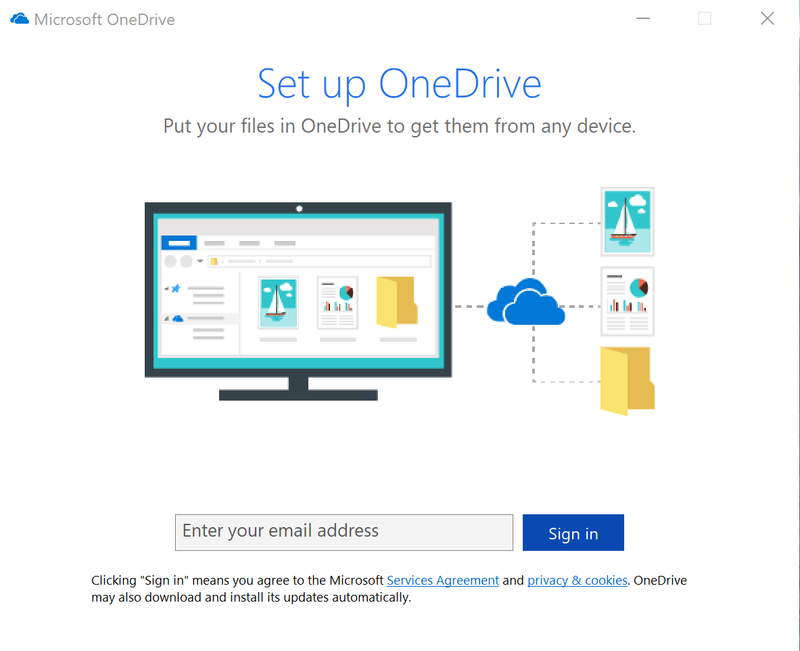 This will ensure your machine is syncing with OneDrive continuously, so you never have to fear a machine or hard drive failure. Once clicked, hit “Ok” to save the setting. Enter your Office 365 sign-in credentials. I say “sign-in credentials” because some companies have a different sign-in than their email. It is usually the same, but if you have a different domain for your log-in than your email, use that as your log in. 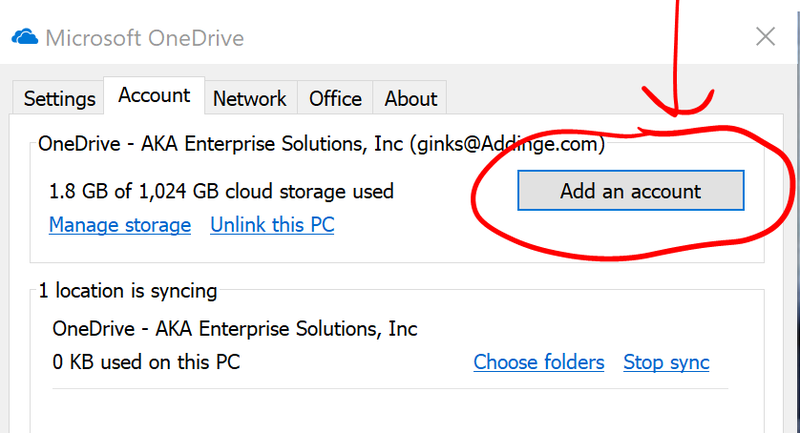 From here, you can change the location of the OneDrive folder (click “Change Location”). It defaults to a folder in your User Folder location (c:\users\<WHO ARE YOU>\), and I recommend you leave it there. This way, its natural to find, and you will always have it as a choice for saving your documents. This is a “habit change,” but I tell everyone this: Instead of saving all your documents in “My Documents,” change it to your OneDrive location. You could replace your “My Documents” with OneDrive, but that is a bit more involved in configuration for a blog post. You will then be walked through a series of informative screens about how the application works. Click through the > arrows to read them. These screens will help you understand how it works, but in a nutshell, you place a document in the folder, and it replicates to the Cloud! 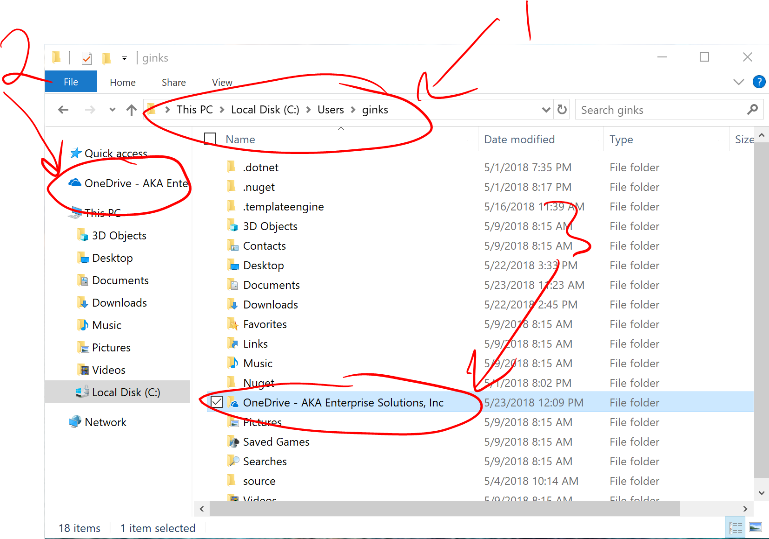 There are icons that will appear on all documents in that folder that will tell you if the document is: a) online in the Cloud but not on your computer; b) both online and on your device and in sync; or c) always on your computer no matter what. 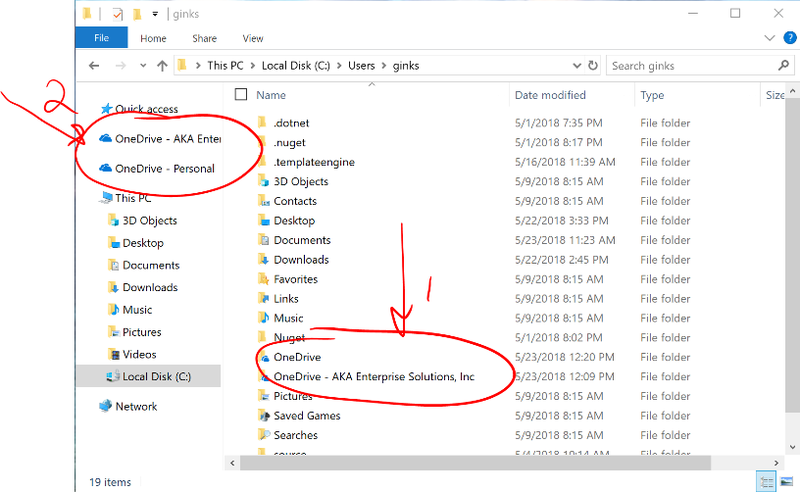 #2: There is a new folder there with the name of your OneDrive account. #3: You now have a new Root folder for OneDrive in your left-hand rail for easier navigation. Right click on it again and click “Settings.” This time, go to the “Account” tab and hit “Add an account.” You will go through the exact same process as before, but this time, use your Personal OneDrive credentials (If you forget, refer to the previous section for details. It’s the same!). #1: There are now two OneDrive accounts in my User folder—one for my business account and one for my personal account. #2: There are now two Root folders in my left-hand rail for quick reference. Both work identically, and both are synced to the Cloud! 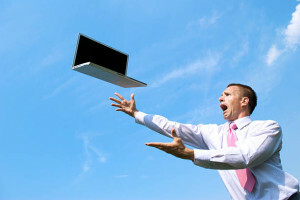 This is just one easy way you can ensure business continuity. Now, as long as you are opening and saving files in these “OneDrive” locations on your machine, they are real-time updated in Office 365. That means, start your work on one machine, and pick right back up from another. If you have a failure on your primary work laptop, you don’t need to worry, because everything is backed up in the Cloud. Taking it a step further, if you have gone this far, you should consider installing Office 365 for Android and iPhone. That way, you can even continue your work from your mobile devices, and leverage the same secure and backed up Office 365 storage location! You can access your documents from anywhere on any device! If your IT department is concerned about security (who isn’t!? ), they can use Office 365 to push remote policies to your mobile devices and help keep your documents safe while enabling you to have that digital freedom. Imagine me, sitting there in the customer’s conference room, opening my PowerPoint presentation on my iPhone, using PowerPoint from Office 365 for iPhone. Just before the meeting started, I noticed the main slide had a typo… I just corrected it from my phone, and did the presentation. When I got my new laptop, there was my presentation. It truly is the Modern Workplace! If you want to free your employees from a single workstation, have the security of an “always backed up” Cloud solution, but don’t know how… read more about AKA’s Digital Transformation for the Modern Workplace, or our High Availability Disaster Recovery (HADR) services, and contact us to talk to a Cloud expert. With two decades specializing in Microsoft and Azure platforms, Greg leads AKA's Cloud practice. He is a Cloud evangelist offering deep expertise in Cloud architectures and adoption strategy. 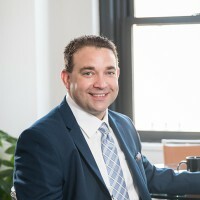 Greg has developed subject-matter expertise and wide-ranging business acumen by working with some of the largest, most successful technology providers and client companies on the planet.